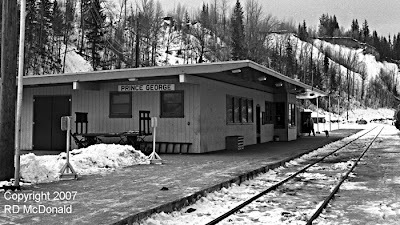 Prince George BC, Mile Post 465.9 November 25, 1959. Route of the “Cariboo Dayliner” North bound Number 1 leaves North Vancouver at 8am, arrives 2nd day at 12:35am – a tenth of a mile short of 466 miles – here in Prince George. The “Cariboo Dayliner” – a lash up of Budd RDC cars – featured reserved seating, steward service, complimentary meals, reclining lounge seats, air conditioning and view-windows! 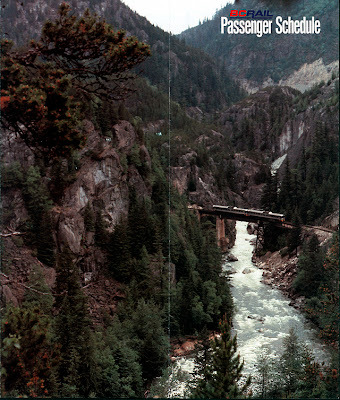 In a feature article on the “Prince George Eventually” Trains Magazine described the route as a “roller coaster” and indeed brake shoe changes were frequent. Grades up to 2.2% we commonplace, as the line drove northward up the gut of British Columbia. Note the ‘60’s station design, with the old-fashioned big-wheel baggage cart maintaining a sense of perspective! Merger Madness? 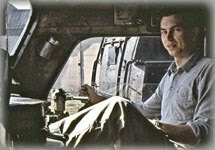 Changing Mile Posts! 100th Posting! 4th of July, 1961. Part 2.